Summary: A spellbinding novel of suspense from New York Times bestselling author James Grippando, in which Miami’s top prosecutor becomes a prime suspect in his wife’s disappearance, which may have a chilling connection to the woman he can’t forget. Unbelievable was the word for her. Samantha Vine was unbelievably beautiful. It was unbelievable that she’d married me. Even more unbelievable that she was gone . . .
Samantha died too soon. Abe Beckham’s new wife has helped him through the loss, but some say it was a step back to marry Angelina, a love from Abe’s past. Abe doesn’t want to hear it, and through the ups and downs, he’s even managed to remain a star prosecutor at the Miami State Attorney’s Office. Then everything goes wrong. A woman’s body is discovered dumped in the Everglades, and Abe is called upon to monitor the investigation. The FBI is tracking a killer in South Florida they call “Cutter” because his brutal methods harken back to Florida’s dark past, when machete-wielding men cut sugarcane by hand in the blazing sun. 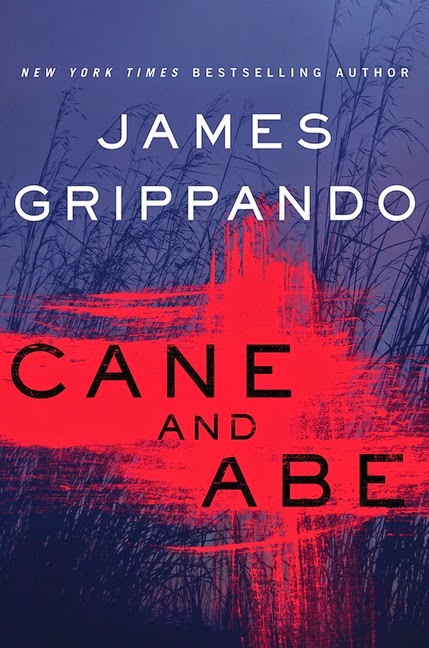 CANE AND ABE by James Grippando is one of those books that I actually wish I'd read! Instead, I passed it along to my dad knowing that he would really enjoy it too. As you can see from his review, he definitely liked it! The main character in CANE AND ABE is Abe Beckham, a white senior trial attorney at the Office of the State Attorney for Miami-Dade County. Abe has a complicated personal life. After his Afro-American wife died, he married his white ex-girlfriend. Abe also has to deal with caring for his ex-wife’s bi-polar brother. He has been assigned to stay on top of a FBI investigation into a possible serial killer who hacks his victims with a machete. The first four victims were white women who were dating Afro-American men. Another woman’s body is found in the Everglades hacked to death. This time the victim is a fast rising Afro-American attorney in a prestigious Miami law firm. Abe becomes a prime suspect in the case when the lead FBI agent discovers that he lied about his past association with the victim. The case is further complicated when Abe’s wife disappears after they fought about his past relationships. The story line now becomes very complex as the hunt continues for the serial killer, the search for Abe’s wife accelerates and the suspicion surrounding Abe becomes more serious as family, friends and colleagues begin to mistrust him. Although Grippando has developed wonderful characters in the novel, particularly Abe, his second wife, his brother-in-law and the FBI agent, I found none of the characters likable. Abe is insensitive to his second wife and his feelings for his first wife are over the top. His second wife is unhappy with Abe’s interaction with his brother-in-law and his strong feelings for his first wife. His brother-in-law depends way too much on Abe and the FBI agent is bitter and secretive. CANE AND ABE is a great read that twists and turns from a search for a serial killer to a troubled marriage. It is somewhat of a dark story that includes racial overtones, family mistrust and a villainous corporation in the Florida sugarcane industry. Author James Grippando weaves the various story lines into one great mystery novel with an interesting conclusion that leaves several unanswered questions to the imagination of the reader. I recommend this novel to anyone who likes a good murder mystery. Thanks to the publisher for providing a review copy of this novel and to Booking Pap Pap for his terrific review. I've only read one Grippando book but I thought it was terrific. It sounds like I should pick this one up too.